【3 in 1 APPLE WATCH STAND】Wonsiadary Stand for Apple Watch is specially design as a station for Apple Watch, a stand for airpods, a holder for iphone. It works for Airpods, all version Apple Watch (38mm and 42mm), Apple Watch Series 3, Series 2, Series 1, Nike+, Sport, Edition; and for all iPhone X, iPhone 8, iPhone 7/ 7 Plus, iPhone 6 / 6s Plus/ 5s, iPad Mini. 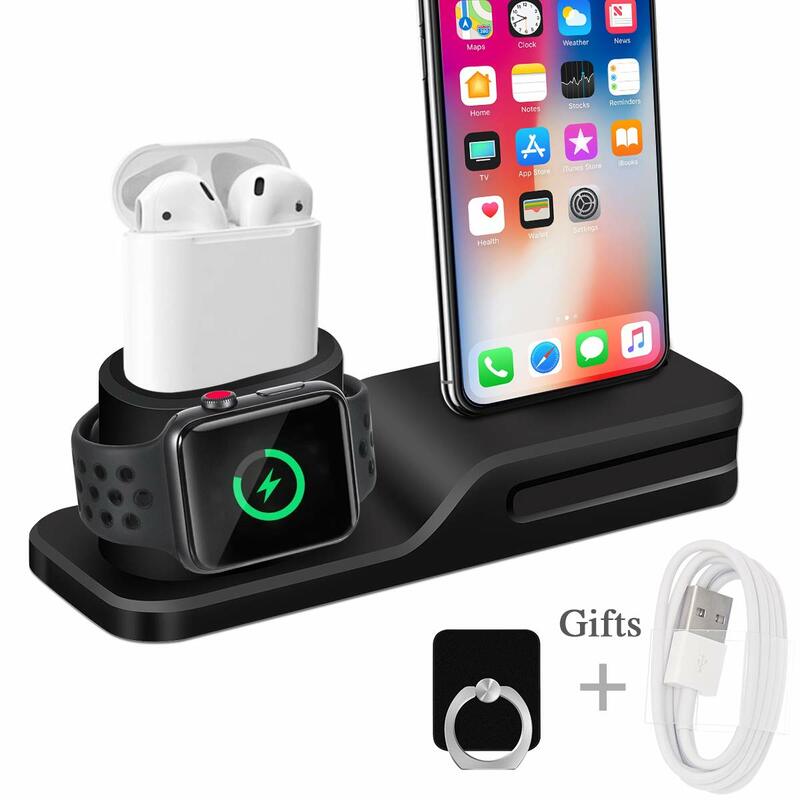 【NICE DECORATION WITH PERFECT ORGANIZATION】 The charger dock supports charge your Apple watch,iPhone and Airpods at the same time and in one place. The experience of Wonsidary Apple watch stand looks compact and elegant, perfectly decorates your bedroom, study, hall, office desk. 【SILICONE SURFACE】The charger stand for apple watch iphone airpods adopts premium silocone, odorless, anti-scratch, anti-slip, anti-waterdrop and oil, easy to clean the silicone holder; Black color stand can be applied for longer time, it’s difficult to see the residues and stains on the surface. This 3 in 1 Charging Stand is a dock for Apple Watch, Station for iPhone and Stand for AirPods. If you have two or more Apple products like iPhone, Apple Watch, Airpods and iPad, then you would like this Silicone maked Wonsidary Charging Stand for Apple . It is a big reunion for Apple members. Serves as an iWatch Stand, an AirPods Stand, and an iPhone Holder, steadily holds your Apple Watch. Specially designed as an iPhone Accessories. We designed horizontal spots made of silicone, which are small and soft to provide enough friction and will not scratch the phone. More and more mobile phones adopt full-screen design like iPhoneX, but our product will not block the screen content when the phone is being placed horizontally, which is very important. Wonsidary Airpods Stand NOT include any iPhone charging cable, Apple Watch or Airpods or Magnetic Charger or Case, it ONLY fits Original iPhone Charging Cable, Apple Watch Magnetic Charger. 【CABLE MANAGEMENT】The stand has grooves on the bottom for cable routing and management. You can minimize loose cables on your desk and keeps your cables in place. It’ll add a touch of design flair to your desk. 【COMPATIBILITY & WARRANTY】Wonsidary charger dock for apple watch is suitable for Apple Watch Series 1/ Series 2/ Series 3 (38 mm and 42 mm)/ Nike+/ Sport/ Edition; Apple airpods, iPhone 8/ 8 Plus, iPhone X, iPhone 7/ 7 Plus, iPhone 6/ 6s Plus, iPhone SE/ 5s/ 5c. We offer 1-Year Warranty and Money Back Guarantee! If there is any issue, please feel free to contact us.